Women have always loved pearls for jewellery and ornamentation for its pure, refined and luminous elegance. Pearls add a touch of sophistication to every look and they are so much more than your mother’s classic single strand for formal occasions. Pearl jewellery has become a contemporary Must Have for modern women today. Don’t miss out: Discover Nomination’s pearl jewellery for all styles that sets pearls with stainless steel, gold and coloured stones on necklaces, bracelets, earrings and rings. Choose the pearls that fit your style the best and make sure to wear them for every occasion. When you think of a pearl necklace the first thing that pops to mind is Mom’s single strand of pearls paired with proper little dresses and blouses. But pearls can be so much more! Today’s pearl necklaces are minimal yet modern and can be paired with even the most basic outfits. Nomination’s pearl necklaces come in long and short styles, some with extra sparkling stones or with large, luminous pendants. Choose the necklace that suits you best. 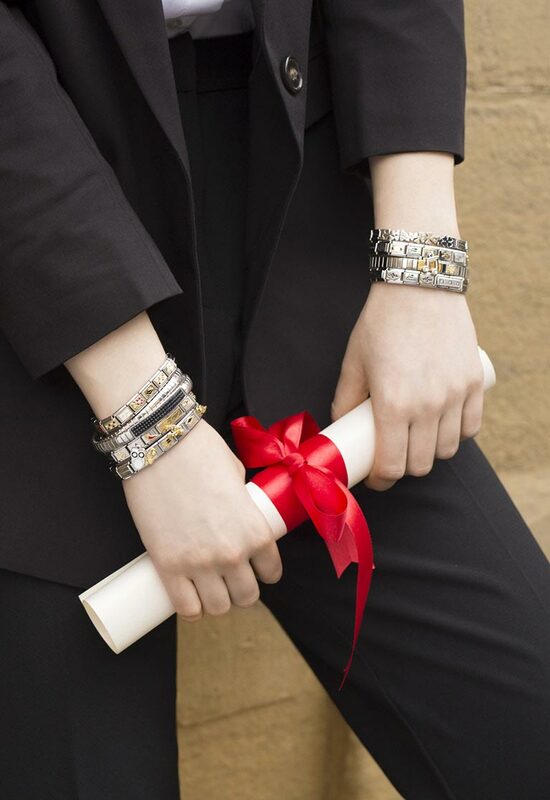 Stainless steel, sterling silver or with gold treated finish, Nomination’s bracelets with pearls are just the right accessory to add that final perfect touch to every outfit, whether it is for a casual picnic with friends or an every day business look or for the most special and formal of occasions. 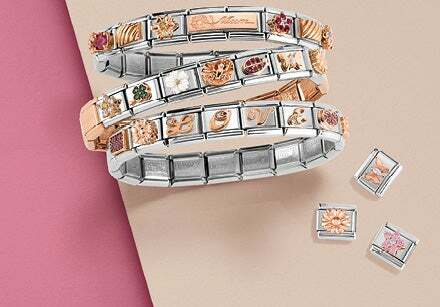 Nomination offers many different options for Composable bracelets with pearls and symbols in gold or with coloured stones. Personalise your bracelet Link by Link with the Swarovski pearl cluster pendant Links in grey, pink, and a range of pastel colours to create a bracelet with delicate, modern look. 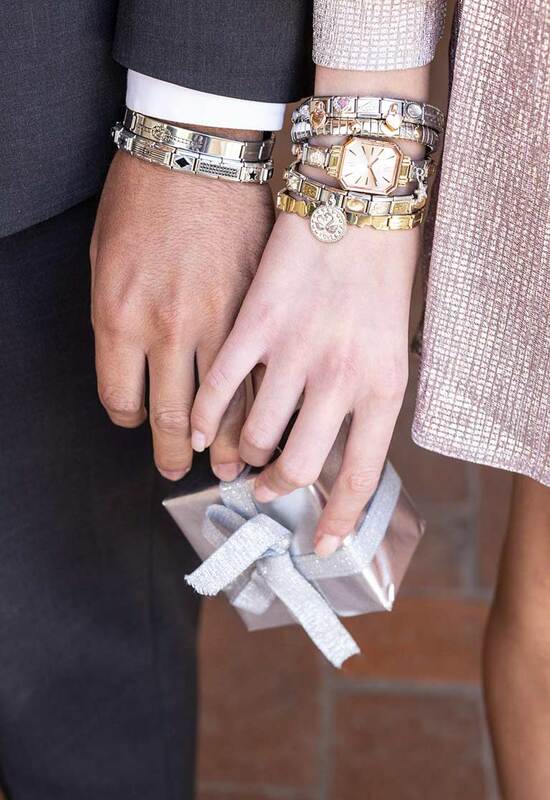 In addition to Composable bracelets, you can also choose from Extension bracelets with pearls and details in gold with coloured stones as well as the more minimal pearl bracelets from the Bella collection, available in sterling silver with rhodium, gold or rose gold treated finishes. Pearl earrings represent that tiny detail that can change a boring look into something magical any day. But which pearl earrings suit your style the best? Maybe it is something small and discreet, like the classic pearl stud earring, perfect on a workday. Or choose long earrings with pearls in sterling silver and maybe even with other sparkling stones to bring a touch of light around your face. Last but not least, pick hoop earrings with pearls if you want a look that is elegant yet playful. Discover all the Nomination pearl earrings and pair them with bracelets, earrings and rings to complete your jewellery look!